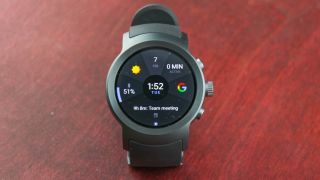 LG only recently launched the LG Watch W7, but it could have several additional smart wearables on the way if newly unearthed patents are anything to go by. Spotted by LetsGoDigital, LG has patented five watch faces, all of which were published on November 14 and four of which have names attached – the LG Iconic, Heritage Chronos, Maximizer and Fraction. You can see them all in the gallery below. The Heritage Chronos looks to be a hybrid watch, as the patent mentions analog hands, while the image shows that it can also display the date and day. Another small hand potentially shows other details (such as progress towards a step count target), though the patent doesn’t give specific examples of what this might be used for. Then there’s the LG Fraction, which looks like a more conventional smartwatch face, though according to the patent could again be combined with analog hands. The LG Maximizer meanwhile shows the day, date and battery level, and based on the name and image might be a larger watch face than most. The LG Iconic looks a bit more unusual, with no conventional hands or display, instead using a small sphere that moves around the edge to act as a second hand. The lights in the larger circle meanwhile serve as a battery indicator, though it’s not clear from the patent how the hour is judged. Finally, there’s an unnamed design, though one which LetsGoDigital reckons might be called the LG Libre, since that name has previously been trademarked. This one is a sporty smartwatch display with a step count indicator, a compass and a temperature gauge. However, we wouldn’t take this as an indication that all five of these designs are in the works for separate watches. For a start, patents often don’t turn into products and five new watches would be a lot. However, it does suggest that LG is actively working on new smart and hybrid designs, some of which we may see on upcoming products. Some of these faces are entirely digital so could also potentially be applied to existing LG watches in future. If LG does have new wearables in the works we might see them soon, as CES 2019 in January and MWC 2019 in February are both obvious launch venues.